"He sat at his desk--last seat, last row--and looked at the chart on the wall next to him. Of course there was no gold star next to his name . . . As long as his name was Bradley Chalkers, he'd never get a gold star. 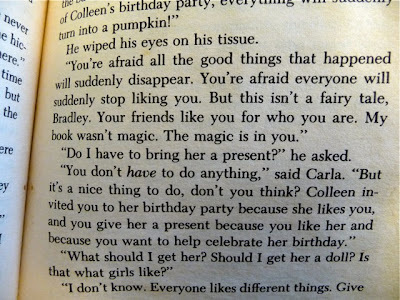 They don't give gold stars to monsters." Jonathan has boxes upon boxes crammed with stuff from his childhood--everything from coloring pages to toys to clothes to wisdom teeth. 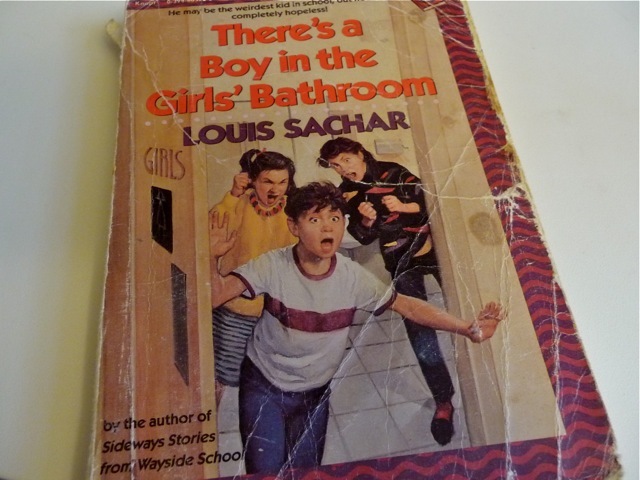 Louis Sachar's There's a Boy in the Girls' Bathroom. Notice the creases and grease stains, no doubt from potato chips, my favorite form of sustenance in those days (who am I kidding, potatoes are still my favorite). 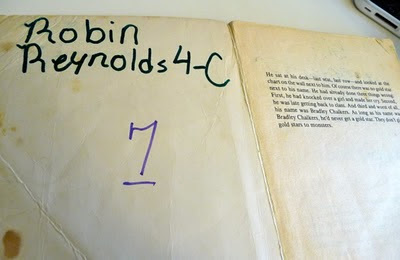 And see below how I branded the inside cover with my attempt at embellished handwriting (I so wished to be able to do an uppercase cursive R like my teacher, but never managed it) followed by my classroom code: 4-C. That stood for 4th grade, Mrs. Christian's class. In my opinion (then and now) the book is absolutely wonderful. The fact that Sachar's name graces the front is the first sign, but open and read, and you'll find a depth and tone and subject (and POV for that matter) that not many publishers seem to trust with children. If I could tell you how many times I read this, even knowing that the last pages would make me cry uncontrollably, I would. 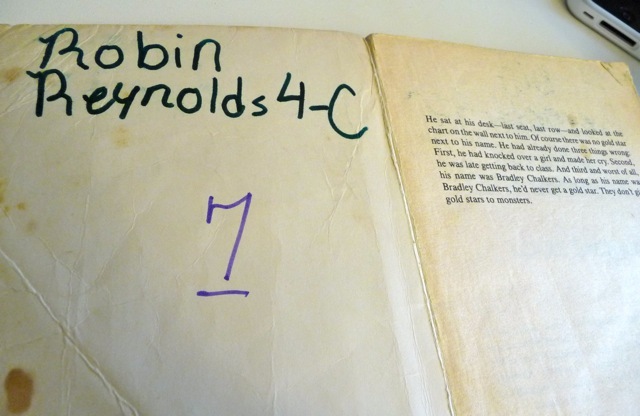 Because on some level other books couldn't reach, this story was real to me. That strange place that is a child's fourth grade mind is inaccessible to most reasonable adults. The grown and experienced would more easily fit through the eye of a needle than into the workings of a child's brain. 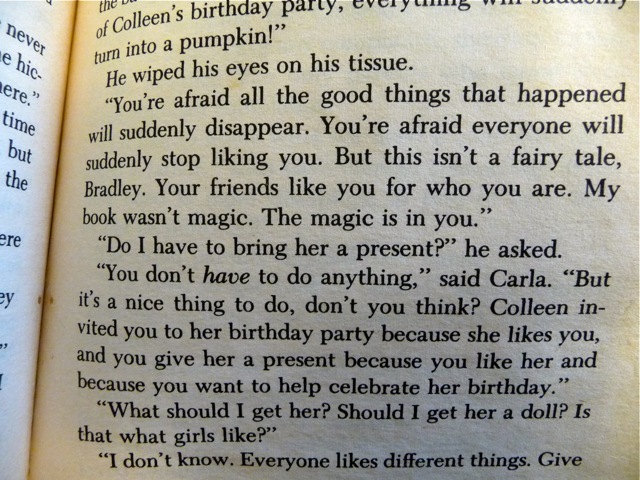 But this book did that for me. I was moved because I empathized and was met on a level I knew and understood. Maybe tons of books do that for kids. I don't know. All I know is that this was my book. It was written just for me. And I loved it. 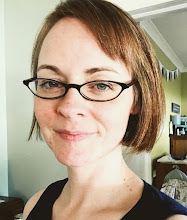 So I'll keep writing in hopes of accomplishing something--of maybe, if I'm really lucky, stumbling back across a world I left behind but still hold on to by a thread.